Using the correct method for destroying banana plants with bunchy top disease is very important. A banana plant with bunchy top and the plant or mat attached to it can be destroyed mechanically or chemically. The BBTV virus moves between connected plants and symptoms require some time to develop, so connected plants may be infected even though they show no symptoms. It is best to remove them also at the time the diseased plant is removed. Mechanical removal is agressive digging out and chopping up of banana corms. 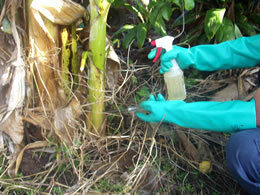 Chemical removal is injection with an approved banana herbicide. 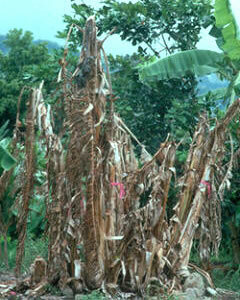 Watch for banana re-growth after treatment; it should be dug out and/or chopped up if it appears. Chemical removal (herbicide injection). The following method is recommended by the Hawaii Department of Agriculture and the University of Hawaii. The advantages of this method are that there is no re-growth of diseased banana plants susally occurs, and aphids die on diseased plants before they can spread the disease to to other plants. Herbicide injection: this method is approved for residential and commercial banana growers. Tools needed for herbicide injection of banana. Saftey equipment including gloves, plastic spray bottle with containing herbicide, and a screwdriver. Step 1. Spray to kill aphids first (see below). Step 2. Cut off the banana bunch. Do not chop the banana stem at this time. Step 3. Use a screwdriver to create a downward sloping hole in the stem at a 45 degree angle, 1 foot from ground level (shown at left). Step 4. Use a hand-pump spray bottle containing full-strength Roundup Ultra Max. Insert the nozzle tip into the hole you created in Step 3. Pump the handle to deliver the desired amount of product into the hole. Step 5. Repeat this process above for each plant in the infected mat. Step 6. Allow the injected plants six weeks to die and turn brown before destroying them or hauling them away. Spray plants for aphids again several days after inital injection with herbicide. BANANACIDE. This product may be used to destroy banana plants infected with the Banana Bunchy Top Virus as well as non-infected banana plants to establish disease free buffers around plantations. Remove all fruit from the plants within the treatment area prior to treatment. Inject 0.04 fluid ounce (1 mL) of this product's concentrate per 2 to 3 inches of pseudostem diameter. Make the injection at least one foot above the ground, except for very small plants, which should be injected vertically into the top. Any subsequent regrowth must also be destroyed. All plants and mats (or units) adjacent (within a 4-foot radius) to a treated mat shall be mechanically destroyed. For control of the Banana Bunchy Top Virus, it is critical that the grower follow a strict control program involving monitoring for diseased plants, spraying to control the aphid vector, and destruction of all infected mats (or units). 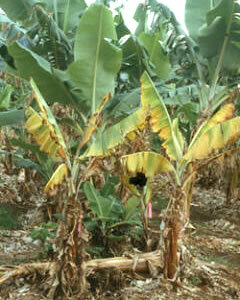 An infected plant may not show symptoms of the banana bunchy top virus for up to 125 days, therefore it is critical that the entire mat (or unit) containing the diseased plant be destroyed immediately. *Reprinted from Roundup Ultra Max label for Hawaii . 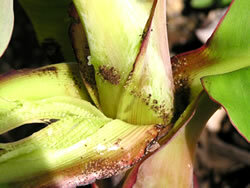 Plants with bunchy top disease usually have banana aphids on them which can spread the bunchy top virus to other banana plants. Therefore, killing the aphids first before injecting the plant with herbicide is very important to stop the spead of the disease. Kill aphids by spraying the entire banana plant with an approved aphicide for use on bananas, such as insecticidal soaps or oils (best fo home owners). Focus the spray on areas where the aphids tend to gather, under leaf sheaths and on the youngest unfurled banana leaves. Farmers manage aphids primarily with approved insecticides such oils and diazinon.